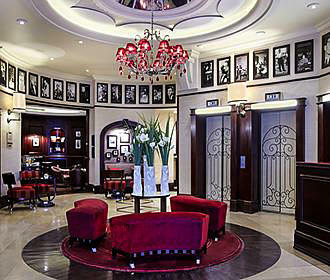 With a modern and elegant feel to the literary themed 5 star hotel, you can enjoy all the refinements and services you would expect such as the recognised Clef d'Or concierge services, a bar, Michelin starred restaurant, buffet breakfast, room service, a business corner and meeting rooms, free WiFi and much more. Located within the 7th Arrondissement in the Saint Germain des Pres area close to numerous tourist attractions in Paris such as the Musee Maillol and the Musee d'Orsay, the Pont Royal Hotel has a rich history that was frequented by numerous famous people including Ernest Hemingway, Jean-Paul Sartre, F Scott Fitzgerald, Boris Vian and many others. Culture and tradition along with modern touches and elegance, are key features of this 5 star hotel in Paris, which still has the literary feel on every floor and within the breakfast room, lobby, rooms and suites, plus within the rooms you can discover old original paintings of the area from yesteryear. As you as you enter the hotel you will be able to see old black and white photographs showing many of the literary stars and artists that used to frequent the place, yet subtly done within the decor there are also quotes and sayings you can discover, not forgetting the bar with cocktails that pay tribute to the memory of former guests such as Albert Camus and Francoise Sagan along with others mentioned earlier. 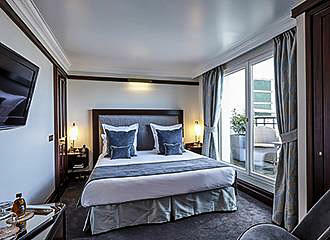 As you would expect from a 5 star hotel in Paris, there is a 24 hour reception with multilingual staff and a travel desk along with full concierge services, including the Clef d'Or concierge, which is a recognised standard of excellence for the services these specific people have been trained to provide. So whether you require secretarial services, restaurant reservations, chauffeur services, private airport transfers, etc, you know that you will be in good hands. The Hotel Pont Royal is disabled friendly as well as Family friendly, with babysitting services that can be organised, plus there is a dedicated business corner along with meeting rooms and even your beloved pets can accompany you upon request and by prior arrangement. Free WiFi is available throughout the entire hotel along with international newspapers, so can keep up to date with what is happening in your own country and with family and friends. There is a luggage hold service offered along with laundry, dry cleaning, ironing and even a shoe shine service, plus this hotel also has the option of secure parking for those of you with your own vehicle. When it comes to drink and dining, you will find that there is a gourmet buffet breakfast served every morning between 7am and 10:30am, which can also be served to your room if required, and if you book directly on the hotel website, breakfast is complementary within the cost of the room, otherwise it is an additional charge. The bar, called the Signature Bar serves delicious coffees and soft drinks along with fine wines, spirits and cocktails, plus you can enjoy a gourmet lunch or fine dining dinner experience in this warm literary setting with leather arm chairs, mahogany wood work and reminders of its illustrious past, which is open daily from 11am through to midnight. Then there is the top table restaurant in Paris called L'Atelier Joel Robuchon, opened by the world renowned Michelin starred chef, Joel Robuchon, which is in itself a Michelin starred restaurant that prepares all the meals for breakfast, room service, lunch and dinner. Open from 11:30am to 3:30pm for lunch and from 6:30pm to midnight for dinner, you can find out more about the Atelier de Joel Robuchon on our dedicated page. 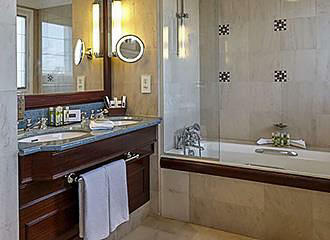 You will find that there are a total of 65 rooms and 10 suites at the Pont Royal Hotel, which are all spacious with high ceilings designed with warmth and subtle lighting for a cosy and homely feel, that have a luxurious bathroom complete with hairdryer, magnifying mirror, bathrobes and complementary toiletries. The literary atmosphere is continued within the rooms and on each floor where you will find many different references to its past with quotes and sayings, and with the rooms all having high ceilings, it makes them feel even more spacious, plus they all have soundproofing and individual air conditioning for added comfort. Standard facilities within each room include a desk, free WiFi, Flat screen TV with satellite and cable channels, two direct dial telephone lines, mini bar and personal safe, plus there is room service, with a Classic room being approximately 18 metres squared as a twin or a double with king size bed overlooking the Rue du Bac or the Eglise Saint Thomas d'Aquin. The Superior rooms are approximately 22 metres squared, whereas the Deluxe rooms are between 22 and 25 metres squared, which can also accommodate a third bed upon request prior, plus these also have a balcony for you to enjoy the City of Lights even further along with Aloe vera complementary bath products for added relaxation and luxury. 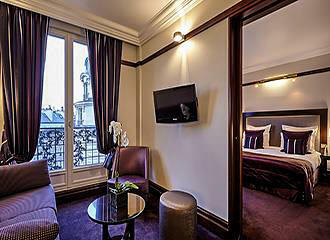 The Hotel Pont Royal also has 15 Executive rooms at approximately 22 metres squared, which are located on the upper floors of the hotel providing magnificent views over the city to some of the famous tourist attractions in Paris such as the Eiffel Tower and the Sacre Coeur Basilica. 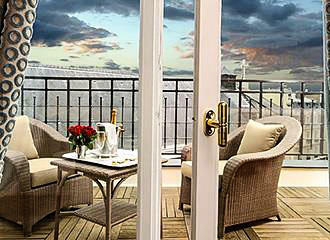 Yet this 5 star hotel also has the Junior Suites, with 10 in total that are around 30 metres squared and can accommodate up to three people and have a living area for even more comfort and relaxation, which are also ideal if you wish to enjoy room service including breakfast, a gourmet lunch or dinner within your room. However, for the ultimate in luxury, there is a Panoramic Suite, which is located on the top floor of the Hotel Pont Royal and at approximately 40 metres squared, it also has a private terrace along with a living area, so you can enjoy relaxation with magnificent views. In addition to this, there is also a connecting room that can be booked alongside the Panoramic Suite, meaning that the entire 8th floor can be privatised just for you and your family. 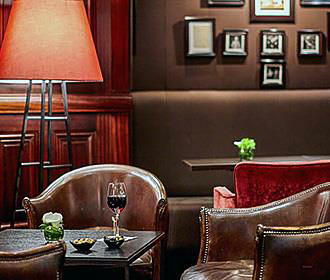 Located on the Left Bank of the River Seine in the 7th Arrondissement of Paris, the distinguished Hotel Pont Royal is situated in the Saint Germain des Pres area only a short walk from popular tourist attractions in Paris such as the Musee d'Orsay, the River Seine and the Musee Maillol. Even though parking within a secure car park is available for those of you with your own vehicle, along with valet parking, there are also airport transfers, chauffeur and shuttle services that can also be organised to make your journey run as smoothly as possible. However, if you are arriving at this hotel via public transport in Paris, then there are several options to choose from within walking distance, with the nearest RER train station being the Gare Musee d'Orsay serving the RER C line. The nearest Metro station is the Rue du Bac stop located in a south westerly direction serving line 12, yet a little further in a south easterly direction and you have the Saint-Germain-des-Pres stop serving line 4. Alternatively, if you are travelling by bus, then the Paris bus lines 24, 39, 63, 68, 69, 72, 73, 83, 84, 94 and 95 along with the Noctilien Night Bus Service via lines N01, N02, N11, N12, N13 and N24 will also get you within easy walking distance of the 5 star Pont Royal Hotel.